A Website Order is "NOT AN OFFICIAL ORDER" until it has been confirmed by phone. We will contact you by phone within 2 business days to Confirm your Order! 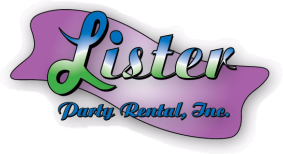 Lister Party Rental Representative at Least 7 Days in Advance! “Excludes Linens & Non Returned Items"
Visa, Master Card, AMEX or Discover. We Do Not Accept Payment Through Our Website!